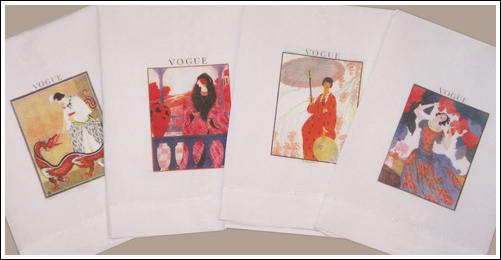 Guest towels are a fine decorative detail, to be admired and appreciated by all visitors to your home. 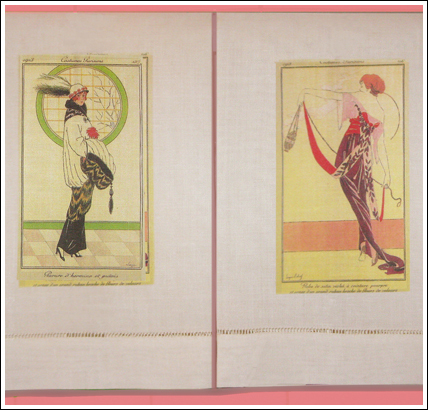 Let these fashionable French ladies from the 1920's give your powder room that touch of class and elegance. They also make a thoughtful hostess gift. All towels are individually hand printed on 100% linen, measure 21" X 14", and are machine washable. The Vogue cover ladies are on white linen. The Costume Parisians ladies are on natural color linen.